St Matthew’s Community Centre started life as St Matthew’s Church over 100 years ago, when it was built in 1902 as a Mission Church to All Saints’, which is just down the road at the bottom end of Elwick Road. The premises were the red brick building you see today, and sometime in the 1920’s a wooden hut was built to the west side. In 1945, the church was made redundant and it was adopted as the Parish Hall of All Saints’. 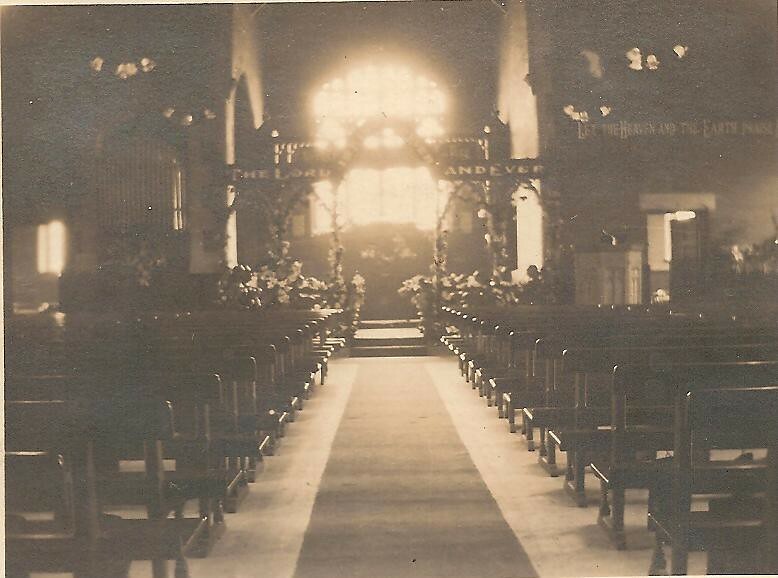 When the church closed, the nave area you see at the back of the photograph was closed off and turned into a stage. The hall continued to serve as a base for the uniformed groups of the church, as well as providing a home for many badminton clubs in the town. In the 1960’s, the wooden hut was deemed unsuitable and it was demolished, and a new purpose built brick hall was built, linked to the large hall. in the early 1990’s the hall was in a dilapidated state. The nave area and its ajoining rooms were in a derelict condition and were used for storage for some of the groups. A Hall Committee was formed and they have worked tirelessly to get funding. The stage was deemed unsafe, and in the mid 1990’s was unsympathetically removed with a plywood wall covering the gap. The Hall Committee worked tirelessly for funding and in 2003, a new disabled toilet in the Small Hall was created, along with a new kitchen and male and female toilets in the main hall. In 2009, we received funding to turn the old Sunday School room into a meeting room. From 2009 to 2011, the whole of the east end of the building was converted, creating a new entrance from Arncliffe Gardens. The layout was completely redesigned to create a space containing three meeting rooms spread over two floors, an office and a kitchen. This area is now host to many smaller groups and is a popular choice for meetings. A new large purpose built store room was built on the north side of the main hall. The Community Centre is also the full time home of the All Saint’s Parish Office. St Matthew’s Community Centre has come along way since 2003. New central heating was installed. 2013 saw the demolition of tenant garages adjacent to the hall on the Eamont Garden side by Hartlepool Borough Council. Plans to build housing on this site were averted by a local campaign spearheaded by the SMCC. As a result the Council then secured and resurfaced the area and agreed a 25 year lease with SMCC for a nominal rent. Thus safe parking was secured for SMCC users, notably the large Toddler group who use the centre two mornings a week. 2014/15 saw the complete renewal of the original slate roof. In 2016/17 the hall floor was refurbished by a professional flooring company and energy efficient LED lighting was installed in both halls. A new inner porch was added to the small hall along with improved landscaping and disable access. Funding is currently being sought for improved kitchen facilities and disabled toilets which will be accessible from both halls (2018).